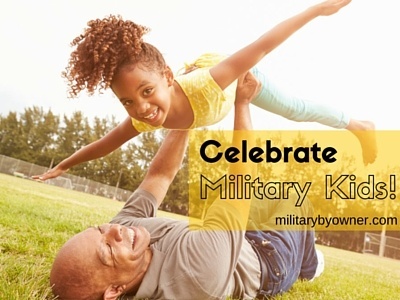 Celebrate Military Kids During April, Month of the Military Child! A couple of days after an overseas PCS move, I wandered into my teen’s room to find him in the midst of hanging up his favorite posters-- boxes and belongings completely unpacked, bed made neatly. While this scenario might be a surprising occurrence to parents of typical teens, it wouldn’t be anything out of the ordinary for most military familes. Our kids are experts at moving and quickly adjusting to life in a new location. We’re also well aware of the other challenges our military kids face at a young age: the deployments and separations from a parent, being the “new kid” repeatedly, and constantly adjusting to the challenges of military life. We owe much to our country’s youngest heroes. If yours is a military family, you probably know that April is designated the Month of the Military Child. How will you celebrate your kids this month? Pat Conroy, one of America’s greatest authors and a "military brat" himself, once penned, “We spent our entire childhoods in the service of our country, and no one even knew we were there.” Thankfully, I think we've come a long way from his childhood days. April gives us an opportunity to recognize and honor the service of military children. In 1986, then Secretary of Defense Caspar Weinberger designated April as the Month of the Military Child to remind us of the significant role military children play in our communities and nation, and to give our country the opportunity to celebrate them. In 2011, Operation Military Kids started the “Purple Up! for Military Kids” initiative that is now celebrated nationwide and on military installations across the world. People are encouraged to wear purple on April 15 to recognize and honor military children. Why purple? Purple is the color that symbolizes all branches of the military, as it combines Army green, Marine Red, and Coast Guard, Air Force, and Navy blue. Wearing purple lets military youth visibly witness the support of their communities. Ease their stress: Deployments and relocations can be tough. Connect with resources and licensed counselors specializing in military life challenges. Surprise them: Find summer camps especially for military kids, including Military Teen Adventure Camps and deployment support camps. Share with us anything special you do for your kids during the Month of the Military Child. We'd love to hear your ideas!